Today we got our first look at how the The Royal Family of the INHUMANS will look on screen, and my first impression … oh dear! Thanks to the early shots at the cast out on the streets of Hawaii we’ve caught glimpses of the characters like Gorgon, Crystal, and Black Bolt, and we’ve realised that the comic source material would both be used and updated when it comes to the looks of the characters. We’ve still been eager, however, for a proper look at the assembled Royal Family. 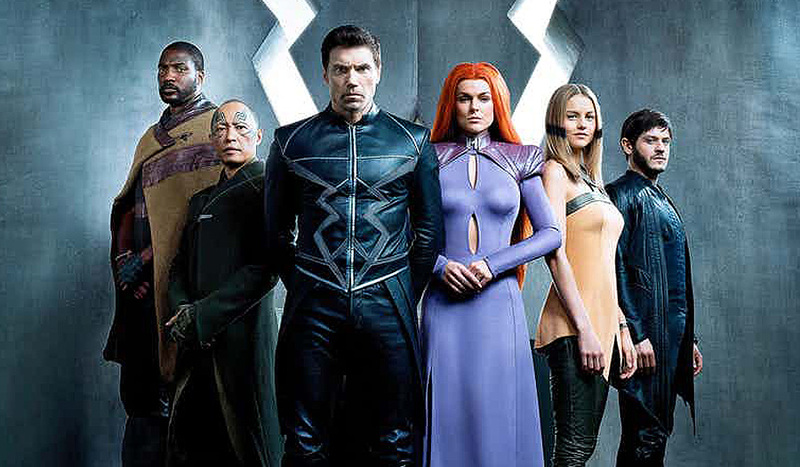 Now, we finally have our first official photo featuring the stars of INHUMANS. My first impression … oh dear! Entertainment Weekly have just premiered the first cast photo, showing off most of the Royal Family in what will be their on screen uniforms. From left to right, there’s Eme Ikwuakor as Gorgon, Ken Leung as Karnak, Anson Mount as Black Bolt, Serinda Swan as Medusa, Isabelle Cornish as Crystal, and Iwan Rheon as Maximus. Missing are family members Triton and Lockjaw, with new addition Auran also not pictured. Dear lord, what is going on… how on earth do these costume designers get their jobs, do they even read an issue of the specific comic title they’re working on! The only member that resembles their original character is Crystal. Gorgon may have his signature cloak, but where is his most important and iconic headband. Oh, maybe in the eyes of the director they thought it would look to ‘Geeky’! Idiots! It’s a TV series based on a comic, A SUPERHERO comic! Each character from a comic normally has one or two defining pieces of their attire that signifies them… so, guess what, the designer goes for the simplest, a piece of what basically looks like a potato sack for a cloak. Maybe this costume designer think Wonder Womans head band looks stupid on screen… thank heavens whoever did these costumes didn’t get the job on Wonder Woman. Those tattoos aren’t even correct for Karnak, Maximus looks like, well, anyone. Medusa, where the HELL is her hair, oh, well at least she’s wearing purple … ridicules. Look at any comic illustration of Medusa and she’s shown with massive amounts of hair that literally has a mind of it’s own … yes, like ‘snakes’ …. oh, maybe THAT is why she’s called Medusa! Ya, think! Then we come to Black Bolt. I’d already seen the snap shot of Anson Mount, filming on the streets and just ‘groaned’ out load…. and believe it or not it was his boots that made me more annoyed than anything. Seriously, it looks like the costume designer went down to the local shoe store and bought the worst pair of children’s boots they laid their eyes on. Any person who works on creating a costume can buy a perfect great looking pair of boots for a superhero costume. Just look up ‘Gotham boots’… it’s that easy! Some guy on YouTube has even made a video of how to make your own pair of superhero boots from an old pair of shoes and some pleather. Instead we’re given the proud and regal Black Bolt in ridiculous, stupid kids boots! It’s just so ‘friggin’ annoying! I seriously just can’t be bothered to comment on the rest of his outfit… I’ve just lost all interest. Marvel, get your TV universe sorted and employ Directors and Costume designers who know what they’re doing and know the source material. This just looks like something that harks back to how Superhero films where attempted in the 70’s and 80’s. Hopefully, as the months go on, we’ll see some more interesting and better material. I suppose it’s possible we may see the characters in multiple looks. Medusa often switches between her more regal attire and a superhero costume in the comics, so it could be we’re merely seeing the family in their court clothes. Maybe, they’ll suit up in different uniforms, as the Inhumans TV show synopsis suggests. I very much doubt it … in my personal opinion, a MASSIVE fail!